"An effect is only momentary ... two half hours are never alike ... So, in these works, it has been the object of the artists to render faithfully, and thus obtain first records of effects widely differing, and often of very fleeting character." 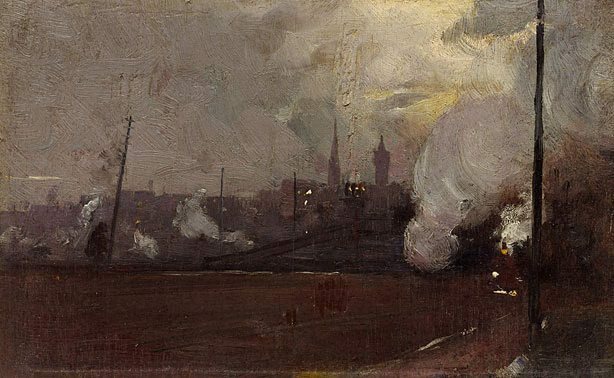 'The national game' and Tom Roberts' 'Evening train to Hawthorn' are two of the 182 'Impressions' that were exhibited in the influential '9 by 5 Exhibition of Impressions' held at Buxton's Gallery in Swanston Street, Melbourne, in August 1889. All works in the exhibition were similar in size. They were painted on small panels, mostly cigar box lids roughly nine by five inches, and similarly framed, in wide, flat, wooden frames with highlights of metallic colour. The 9 by 5 exhibition was intended to provoke a response because such paintings would normally have been considered preliminary sketches for larger works and consequently unsuitable for public exhibition. The exhibition proved to be central to the development and subsequent reputation of the Heidelberg School and was a turning point in the history of Australian landscape painting. Golden summers: Heidelberg and beyond , Melbourne, 1985, 121 (colour illus.). Mary Eagle, Tom Roberts , 'A Painter Making Himself', pg. 38, Adelaide, 1996, 56, 201 (illus.). Vivienne Webb, Australian art: in the Art Gallery of New South Wales , 'Golden age', pg. 37-38, Sydney, 2000, 56 (colour illus. ), 302.